Sonny and Bright hold a Special Olympics soccer ball. Bright smiled and laughed, clearly enjoying a little humor as well as his visit to Washington as one of 12 Special Olympics athletes selected as Sargent Shriver International Global Messengers for the next four years. Sargent Shriver, who died in 2011 at age 95, was the husband of Eunice Kennedy Shriver, who founded the Special Olympics movement for intellectually disabled athletes. Bright is from Botswana, and like Yours Truly, he enjoys a variety of sports, including soccer, volleyball and track and field. 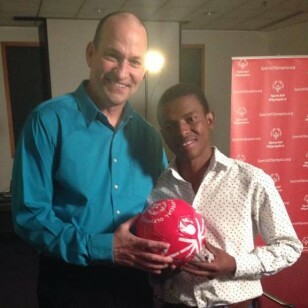 During a short video interview on the Voice of America’s Africa 54 TV program, the 22-year-old Shadi talked about his new role as a spokesman for Special Olympics. As we heard Bright say in the interview, he’ll be in Los Angeles in July for the 2015 Special Olympics World Games. 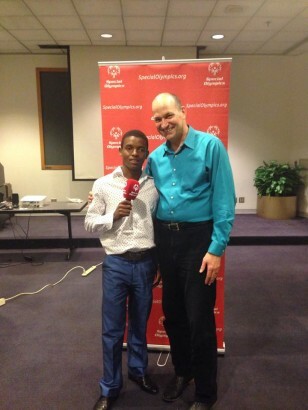 Bright and Sonny at Special Olympics headquarters in Washington, D.C. The Honorary Chairs of the 2015 Special Olympics World Games are U.S. President Barack Obama and First Lady Michelle Obama. Approximately 7,000 athletes and 3,000 coaches from 177 countries are expected to attend the big event, which will feature competition in 25 sports throughout the Los Angeles region. It's a Capital Challenge for VOA Race Teams!